What’s in a name? (you never guessed that I’d start with that amazingly creative phrase did you?). I actually don’t know the answer to that, but it has caused me days of thinking. Wasted days, as I have no conclusions but at least I have something to write about. When I started making music I had this problem of what to call myself. I mean, my parents once decided I should call myself Sverrir Pálmar Valgeirsson, and that has worked out quite ok in life, but it doesn’t exactly roll of the tongue like ”Traveller” or ”Beyonce”. I could go just by first name and be ”Sverrir” but the relative number of r:s in the name (42,8%) seems to be a bit higher than the average rock star name (7.4%), so it doesn’t really work. 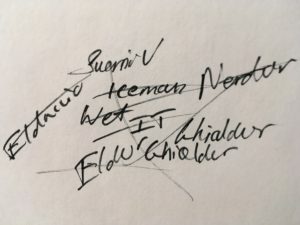 I have thought about calling myself different things like ”Wet” (I used to be a swimmer and as a wannabe Amiga demo coder I needed a name and for some reason chose that), Nerdur and some other stuff I can’t remember but I couldn’t make up my mind. In the end I chose to call myself ”Sverrir Valgeirsson” to show how genuine I am. That hasn’t worked out at all of course and I am still a completely unknown rock star with a name no-one can pronounce, but at least I remember it. I have since I launched my music career also started a band with my very good friend Arianna Benigno. We also played around with different names, but after discarding different combinations of words from Icelandic and Italian we came up with AIIS. Kinda easy to say at least and you can never guess what it stands for so it’s mystic too. That should attract people in like flies right? No. Under death threats, close friends and family will listen to a song and then get on with their lives and the rest of the world still doesn’t care that the best music ever made is now available. So I guess what I am trying to say is that there may actually be an answer to the question of what’s in a name. The answer is, nothing.